SoulCollage® is a creative expression through collaging, like journaling through images. With SoulCollage® you use images, scissors, and paste to make collaged cards contributing to your own personal deck of cards. Each card you create uniquely represents aspects of your personality, evolving into a source of remarkable personal insight. Every card is made from images you are intuitively drawn to—for reasons you may or may not yet fully understand or appreciate at that time—creating powerful imagery, and giving voice to the many parts of your self. Use your deck for personal guidance through intuitive readings of your cards, providing a profound journey of self discovery. Whether three cards or 100 cards, your deck is a gift of timeless counsel waiting for you in every card you create for your deck. 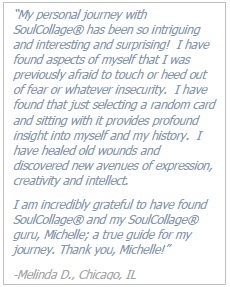 SoulCollage® is intuitive, creative, empowering, and such fun! The deck you create reflects all that is you, it visually speaks to your life story–what a beautiful way to honor your inner wisdom. As your trained SoulCollage® Facilitator, I have deep respect for your space and personal experience during a workshop, you will always feel gently supported by myself and others present. In my SoulCollage® workshops, you will have opportunity to make cards, learn more about the three trans-personal cards, and the four suits that make up your deck (Committee, Community, Companion, Council). You will learn how to read your cards privately as well as experience empowering group readings with your cards. I offer Introductory to SoulCollage® workshops, private and group readings, and workshop series that focus on certain themes or suits within the SoulCollage® deck. One of my favorite workshops beckons our inner poet, using images and SoulCollage® cards as a generous muse for writing poetry. As part of my mission of blending creativity and nature, I strive to provide workshops and experiences that honor an individual’s connection to nature and their creative self. SoulCollage® beautifully blends these themes and settings honoring nature, her creatures, the elements and archetypes often appearing in cards. I also love taking SoulCollage® groups on the trail for readings. Imagine the added insight and experience of consulting your cards beneath the shady canopy of a lush oasis, or in a group surrounded by steep and striated canyon walls, or during the full moon while laying on a vast sand dune, or quietly centered in the middle of a large walking labyrinth. These are powerful settings for self-introspection. Inspiration abounds. SoulCollage® workshops offer a dedicated space for creating cards, and reading your SoulCollage® cards where your insight is protected in a sacred circle of sharing within a community of like-minded people who respectfully bear witness to your journey. SoulCollagers are happy to play, create, and share, and groups are carefully facilitated with great respect for everyone’s comfort and confidentiality. You will have time creating your cards, working and sharing at your own pace in a non-competitive atmosphere. learn helpful ways to use your deck as a self-guidance tool that is a true reflection of your ever-evolving life journey. During a SoulCollage® workshop or outing you will feel supported along with a feeling of camaraderie with fellow creatives. You will be delighted by the diversity with which every one expresses her/himself. You will leave inspired and more centered for having s pent time in closer touch with your own inner self and having shared from a deep place of reverence and attention. Come and let the images inspire you, let them cultivate your creative space from where they will offer guidance any time you wish. As your SoulCollage® Facilitator, I am honored to share this experience with you. I will hold sacred space for you while you create new cards, share, and explore the creative insight revealed through your cards. Whether you have few or many cards in your deck, each offers its unique voice, honoring all aspects of your self, personality, history, spirit. 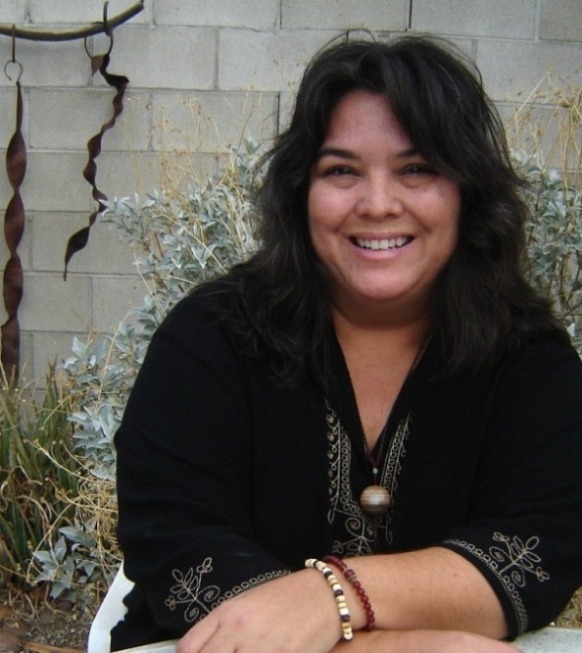 I will be present for you and hear your personal wisdom, during private or group readings as you tap your intuitive gifts and speak your card’s wisdom. I will also provide all materials for you to create new cards during card-making workshops. I wouldn’t ask workshop participants to try anything I am not willing to try, and the moment I made my first SoulCollage® card, an unexpected world of creative and personal introspection opened up to me. Initially, the ease and accessibility of the materials and the process of collaging appealed to me as something fun to integrate into my workshops. I could appreciate the value of potential insight collagers could experience. But as I began making my own cards and learning to read them—while learning more about suits and archetypes–I was amazed and intrigued by their effectiveness, by the intuitive wisdom presented, and well…how the “voice” of each card just somehow shows up, and in sometimes very unexpected ways! I find simply looking for images and collaging both fun and relaxing. In addition to the creative outlet, reading my cards was yet another part of the journey. When I finally experienced my first group reading, it was a powerful experience. It was an experience I definitely wanted to share and pass along for others to discover in my own workshops. I use my SoulCollage® cards for daily insight and as a reliable source of creative inspiration, particularly for writing poetry and painting. I also use my cards for large life decisions, problem solving, and meditation. Sometimes I just want to feel that spiritual presence, or to feel connected to my animal guides found throughout my deck in the Companions, Council, Committee, and Community suits. I find this creative, self-exploration through such vivid imagery quite empowering. And I like how your instincts begin to come alive during your own personal creative process, gently inviting you to experience the magical synchronicity revealed in the wisdom of your cards. Michelle with SoulCollage(R) founder, Seena Frost. I first discovered SoulCollage® online (through this creativity site) in 2012. It completely resonated with me and uplifted my creative goals, giving them new life. I was so moved and inspired by the process that I immediately registered for the next available training weekend near me. I eagerly waited 5 and a half months for the opportunity, completing SoulCollage® pre-requisites — reading the recommended books, listening to CDs and happily creating cards. I became a trained SoulCollage® Facilitator in February of 2013, having the honor to train with the founder of SoulCollage®, Seena Frost, M. Div., M.A, along with Mariabruna Sirabella, M.F.T. and SoulCollage® Facilitator Trainer, and Diane Jacobson Born, SoulCollage® Facilitator Trainer. It was an intense, yet inspiring–dare I say MAGICAL time thanks to these trainer/mentors, my fellow trainees, and the experience itself. In the beginning, I quickly discovered more about this simple, yet powerful intuitive tool. I saw galleries of inspiring images and collages created by a vast community of SoulCollagers from all over the world. I was instantly drawn to the vivid imagery in their cards and I could feel the presence and the open honesty expressed in each card. This only magnifies when participating in groups and workshops with fellow SoulCollagers in person! I found SoulCollage® to have a friendly, creative appeal and further discovered the blessings of its vast and supportive community–a collaborative gathering of generous souls eager to share the sacred experience that is SoulCollage®. I very much enjoy guiding fellow creatives in expanding their creativity through experiences like this. I became a Facilitator because I see SoulCollage® as a natural, very approachable and fun way to engage people in something creative. Inspiration and muses often just sneak up on you when you’ve engaged in some form of hands-on creative expression. I’ve met many talented artists and writers who are reluctant to acknowledge their creative gifts. The SoulCollage® process invites your inner creative to come out and play in such a supportive and wonderfully personal way. Since discovering SoulCollage® I continue creating cards, adding to my own personal SoulCollage® deck, ever-growing and engaging me in a continuously evolving, artistic expression of personal wisdom. I believe your SoulCollage® deck will become the same for you, a sacred and timeless counsel honoring your personal path. For my upcoming workshops click here. SoulCollage® is a registered trademark of SoulCollage LLC. The SoulCollage process is described in Seena B. Frost’s book, SoulCollage® Evolving, and more information about SoulCollage® can be found at www.soulcollage.com. SoulCollage® cards are not to be sold, traded, or bartered to respect the artists whose images are collaged in the card and are to be reproduced only for the personal use of the maker of the card. 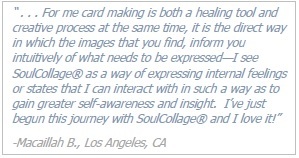 SoulCollage® cards may be used as examples to illustrate the SoulCollage® process, but it is a principle of SoulCollage® that SoulCollage® cards are not for sale, trade or barter. Become a Facilitator! Visit www.soulcollage.com To facilitate groups called “SoulCollage® Group” or to call oneself a “SoulCollage® Facilitator”, one must attend a SoulCollage® Facilitator Training. For more information, read “The Principles of SoulCollage” at their website. I Am eagerly awaiting to attend one of your classes:) Im excited! ! !looks incredible .Have a good day! Thank you, Claudia! I am looking forward to seeing you soon at an upcoming workshop! Do you find images in old National Geographic magazines? When I worked on used-book sales for my Friends of the Library, we called them “the yellow curse” because we’d get so many… and they turn up in garage sales a lot. Provocative pictures and good quality printing sound important to the cards, to realizing what you imagine. I was just glad I could access it easily! I knew which magazine & which theme issue, and about where the magazine was. The last time I rejected an image I really needed, it took me the better part of a day to find it again and realize it was the one. It was an interesting class, and a nice life to explore. I’m reminded by typing this that I need to go save the recordings so I can use the meditations again if I want to. Really love your Soul Essence card–beautiful. I have a Source card, but haven’t yet found inspiration/images for a Soul Essence card–as far as I know! Am just about to attend a SoulCollage teleclass today, btw–Esperide’s on past lives. Just made a card for that … I’d seen the image but thought it was too similar to what I already had saved. Ended up going back to it anyway 🙂 Take care.